We offer a variety of wood stain colors to bring out the grain and lustre of both main and trim woods. Typically maple is stained, but any wood can be. Any stain color you see on the website - and any other color - is available for your custom banjo. 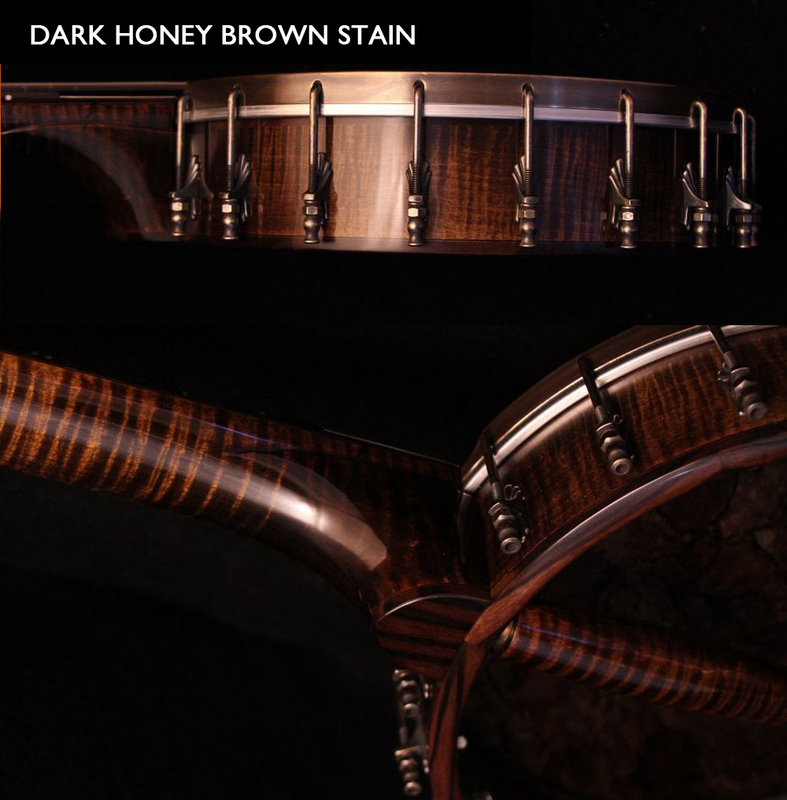 Below are just a few examples of stain colors we've used on custom banjos. We offer an ebony-like coating on rims, usually over a rock maple base, giving a hard black finish on the rim. After applying several coats of bronze to the rim, we use various techniques to create a patinaed and aged look and feel. We believe the heavy coats of bronze on the rim add a little extra depth to the tone. 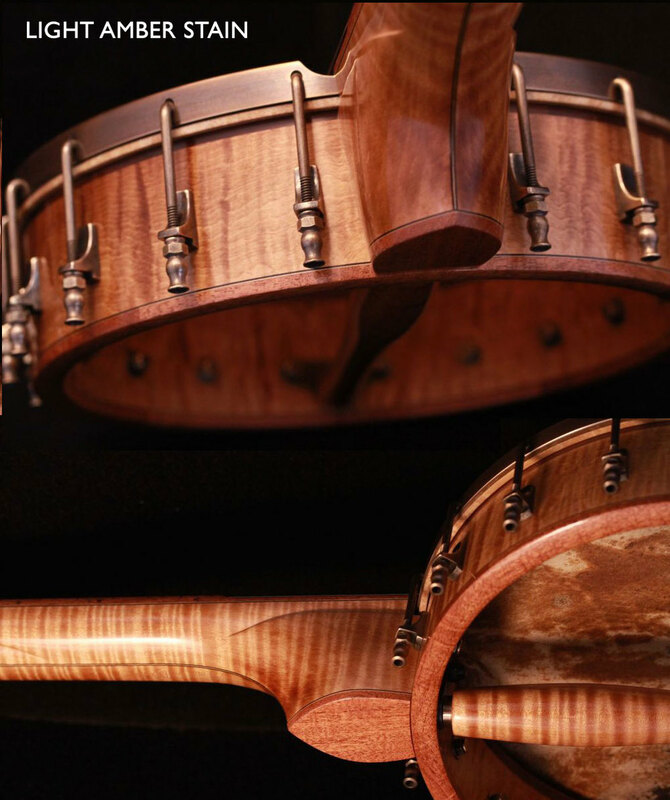 We offer three finishes for your custom banjo. Our first and most basic finish is a penetrating oil finish. This finish penetrates and seals the wood, but doesn't offer a topcoat or "skin" like our other finishes. The result is an extremely smooth and natural look. While less protective against dings and scratches, the wood is completely protected from the elements. Due to our application process, this finish is not suitable for stained woods; walnut and unstained mahogany are the best woods for this finish type. Our second finish type involves a coat of shellac to bring out the lustre in the grain, followed by several light coats of a water-based urethane finish. This finish gives a durable but thin skin over the wood. This finish is hand-buffed out to a satin. The texture of porous woods will still be apparent. Our most-commonly used finish is a two part finish. Starting with a coat of shellac, we then apply many thin coats of a water-based urethane finish. Finally, it is machine buffed to a high gloss finish (like what you would see on a modern guitar). Very hard and durable, it offers excellent protection and enhances the beauty of the wood.